So I wasn't going to blog until NYE and instead spend time with the kids and husband but (at time of writing) I'm just back from an 8 mile cycle with my son and the girls are away with their dad so I think I deserve a blog-fix to fill you in on what I've bought (so far) in the sales. Throughout, and I'd recommend this to those of you heading out sale shopping, I've tried to buy items that will see me into spring. I've resisted gorgeous winter coats from Zara, chunky knit jumpers from Mint Velvet and cosy fur boots from Boden…and instead reminded myself that the weather's going to improve from February and sure we'll have our summer in March like last year, so I'll work the winter wardrobe I have until then and instead focus on buying some useful transitional items. 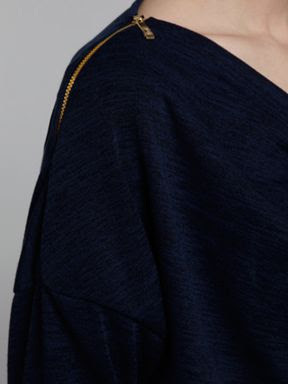 This zipped version comes in 3 other colours and has a flattering wrap detail across the tummy. 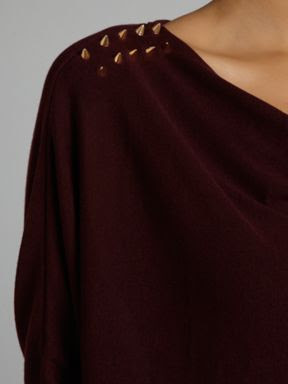 Also comes with a stud detail on the shoulders, which looks stunning in the burgundy colour.. It's hard to do it justice without wearing so I'll share it on the blog in the next week. Also on Boxing Day, I picked up some Linea loungewear - a soft jersey draped cardigan (similar) and some wide-legged pants (similar). Finally, on this post, I'm sharing my most favourite sale purchase. Do you remember when I had my session with Rebecca, the Victoria Square stylist and she put this jacket on me? Well, I resisted (very reluctantly) at the time and guess what? There it was - only one…waiting for me in the River Island sale. Down from £60 to £30. It is now in my wardrobe. Worth the wait I'd say! I still have some M&S purchases to share from a visit there yesterday, and some Christmas presents to show you. As Miranda's friend says 'bear with, bear with' - I'll get it all on the blog really soon, I promise. I really like those tops from Wal-G but disappointed to see that their M/L size is the equivalent of a size 10-12!! hope it was better for you!! Good bargain buying, well done you! I am awaiting some grey ankle boots and that's it! I have been VERY good so far NOT to be seduced but I may crumble if I venture towards TK Maxx! I have been remarkably restrained. I went past a Zara yesterday but was tempted by nothing - I'm one of those who has an eye on the Spring stock as soon as the 25th has gone. So glad you picked up the River Island biker jacket though - it does really suit you. Your wee jacket is adorable too, amazing price! I've done a fair bit of damage, most excitingly from Celtic Sheepskin where I could spend a small fortune! Wow, Avril, your certainly a sales queen. I am so loving the river island jacket. I tried on the beige leather waterfall one I blog about and you told me it was half price, it didn't suit me even thought it was lovely.I love the knits you got! Love the shoes and the zip shoulder top. Fashion fate was at work with the jacket!! Great bargain. Have been v restrained......but not for long!! HNY Avril. That's some cool stuff u got girl ! Thanks so much for ur comment on my blog ! Happy New year ! I haven't yet really hit any sales but that could change today. I love those office shoes! Avril, thanks for commenting back! Its been very nice to stay in touch! I love your new items! Your closet will be thanking you! My favorite item is your new jacket that you have been wanting, I dig when that happens! Finding something you love on sale is always the best! 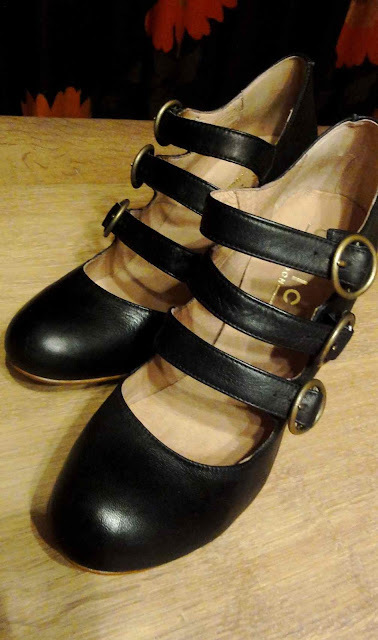 Last spring I REALLY wanted these cynthia vincent wedges (they were even called "the jaggers" so I wanted them even more) But I couldnt shell out 300 bucks for them! While I was back home visiting stockton I went by the crossroads outlet and found a pair in my size for 13 dollars! They came home with me : ) I hope you are having a nice day! Welcome back, I've been waiting hard to hear how you got on at the sales! I love both the top and jacket. Also picked up a Savida dress in Dunnes for £12 reduced from £34! That was it, hope to get back in next week to the shops when there may be further reductions!